Recently two tourists found engraved petroglyphs on a Hawaiian Beach. This was an important find because it suggested that the ancient Polynesians had a common writing system which was used from Hawaii to Easter Island. These inscriptions were accidentally found on the coastline at Waianae, Oahu Island by Lonnie Watson and Mark Louviere of Ft. Worth, Texas. The petroglyphs were only seen after sunlight illuminated the signs along the shore line for a limited period of time. The Waianae signs are dated several hundred years before Europeans reached the Hawaiian Islands. The Waianae petroglyphs are interesting. They resemble the inscriptions on the Rapa Nui Tablet of Easter Island, in a script we call Rongorongo. Rongorongo inscriptions have been found on Easter Island. Researchers have suggested that the writing is related to the Indus Valley script. Most archaeologists believe that because Rongorongo and the Indus Valley writing are separated by thousands of years the two scripts are unrelated. The Waianae petroglyphs are interesting because they were found on the shoreline. Most Hawaiian inscriptions are found in fields and on smooth pahoehoe basalt (a smooth, shiny rock from lava flow). The largest Hawaiian petroglyphic field is situated in the Hawaiian Volcano National Park at Pu’u Loa. The Pu’u Loa site is the largest field of petroglyphs in Polynesia. The most authoritative book on Hawaiian petroglyphs is Petroglyphs of Hawaii , by Likeke R. McBride . Judith Sutcliffe, Electric Typographer (1993), has also published some Hawaii petroglyphs. The Hawaiian figures are engraved in lava. There are some “stick” like figures similar to the Waianae inscriptions found on the Big Hawaiian Island. But the inscriptions on Maui and Lanai show human figures with thick upper bodies and three legs . We can see the common thick torsos humans found in Hawaii in Figure 2, below. Hawaii is usually seen as an isolated group of Islands in Polynesia. As a result, it is surprising to discover petroglyphs on the Hawaiian Islands that resemble Rongorongo writing. The Waianae signs were found on the Island of Oahu, on the Waianae coast. The Waianae signs stretch 60 feet (18 meters) along the beach. These are the first Hawaiian petroglyphs found along the shore as seen in Figure 3. These signs are very fragile and may be mutilated or destroyed because of where they are engraved. Also, because of were the inscriptions are located along the shoreline they are usually covered by sand. In Figure 3 we can see the Waianae signs. The Waianae signs are straight, while the Rongorongo writing is squiggly. In Figure 3a, we can see the Waianae linear signs. Hawaiian State Archaeologists who have visited the site said there were 10 signs found at Waianae. Archaeologists have dated the petroglyphs to be four hundred years old, which is around the time the Rapa Nui Tablet was written. Before the discovery of the Waianae petroglyphs, Hawaiian glyphs averaged around one foot (30 centimeters) in diameter. The Waianae inscriptions are between four to five feet (1.2 to 1.5 meters) in size. The large size of these petroglyphs indicates that they may have been made to be seen by people out at sea. The Waianae signs stretch 60 feet (18 meters) along the beach. They are characterized as linear stick figures. Linear human figures are common in Hawaii, but the Waianae humanoid petroglyphs are stick figures, while in most Hawaiian humano-figures the torso is thick, as seen in Figure 2. In Figure 4, we compare the Rongorongo and Waianae signs. On the left hand side of the figure we have Rongorongo signs and on the right we find the Waianae signs. 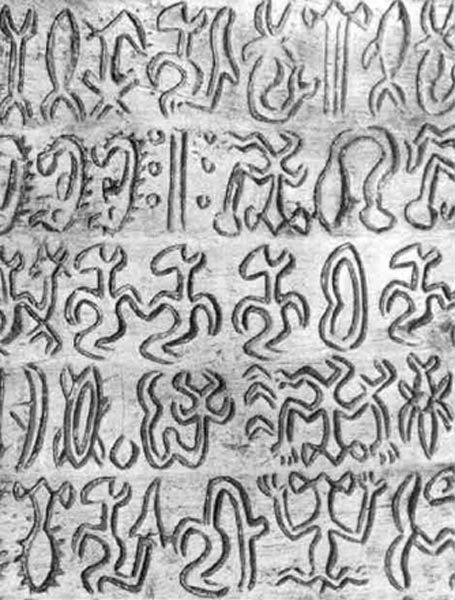 It is clear that except for the squiggly nature of Rongorongo characters, they are strikingly similar to the Waianae petroglyphs. The inscriptions which were found along the shore of Waianae, Ohau are important in Polynesian epigraphy because they are strikingly similar to Rongorongo writing. This comparison suggest that a common system of writing may have been used on Easter Island and Hawaii. The Waianae inscriptions are not the only inscriptions found on the Islands as discussed earlier. The State Historic Preservation Division and the U.S. Army say the new signs from Waianae complete a total of 17 signs found on the Island. Today the Waianae signs are again hidden under the sands on the beach. Likeke R. McBride, Petroglyphs of Hawaii , 2004. Judith Sutcliffe, Electric Typographer , 1993. 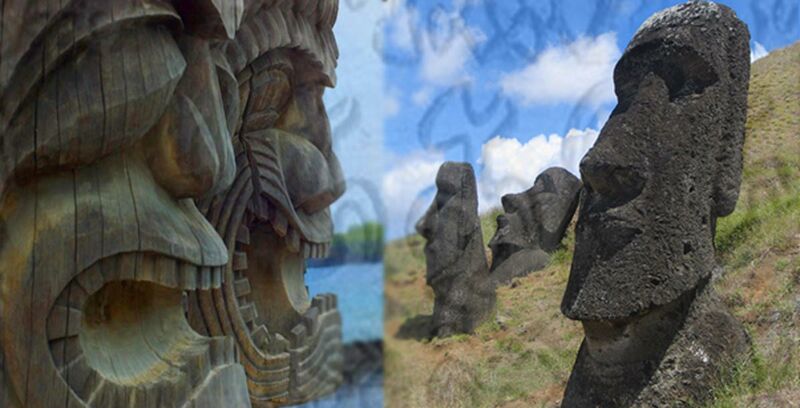 Moai builders are very ancient people from the times there were one people one language all over the earth. Rapa Nui people are the people of RaBaNa, our Godess Ra and they speak a latest development of ancient Bulgarian language very much alike to today Arabic language whereas rabana still means the same - Our God . Rapanui people danced the still existing today Bulgarian folklorique dance oro, ori and they even preserved the Bulgarian name of the dance. They did not use writing, but protowriting system like the runic Bulgarian writing depicting symbolized scenes of their everyday life in between fishing and servicing Godess Ra in rituals. Moai are their sculptures venerating the Goddess Ma (also called MaRa) of Ancient Bulgarians, the Goddess of Fertitlity. Moai were building those statues high enough in order to use them as an orientation point for the sailors on one side, but also as a sign of honoring the Goddess of fertility in order to receive better fishing results. This is how the name of Moai came as service to Ma. The writing system of RaPa Nui people is called Rongorongo which also is of Ancient Bulgarian origin. Rongo comes from RanGa and has the meaning of Signs of Godess Ra AllMother of Ancient Bulgarians (Ran / Run / Ron) written on earth (ga). From RanGa comes the Bulgarian word Rang meaning level, which later on became Range in the Latin languages, derived from Ancient Bulgarian language which was the firs human language. From the Ancient Bulgarian root Ran comes the name Run / Runi. Runic signs are exactly this for Ancient Bulgarians - God Ra AllFather of Ancient Bulgarians'signs on earth.